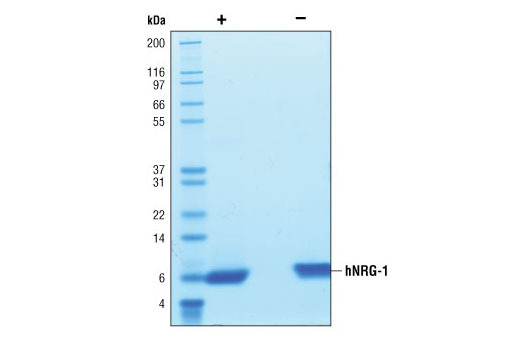 The purity of recombinant hNRG-1 was determined by SDS-PAGE of 6 µg reduced (+) and non-reduced (-) recombinant hNRG-1 and staining overnight with Coomassie Blue. The proliferation of MCF7 cells treated with increasing concentrations of hNRG-1 was assessed. After a 7 day treatment with hNRG-1 cells were incubated with a tetrazolium salt and the OD450 - OD650 was determined. 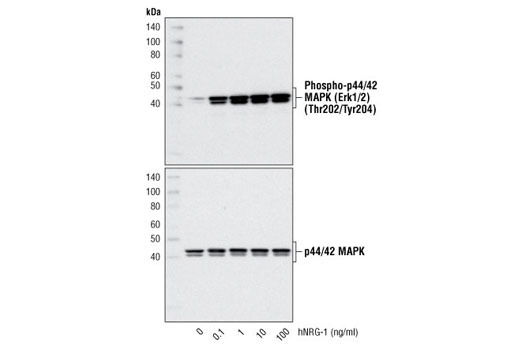 Western blot analysis of extracts from MCF7 cells, untreated or treated with hNRG-1 for 7 minutes, using Phospho-p44/42 MAPK (Erk1/2) (Thr202/Tyr204) (D13.14.4E) XP® Rabbit mAb #4370 (upper) and p44/42 MAPK (Erk1/2) (137F5) Rabbit mAb #4695 (lower). Recombinant human NRG-1 (hNRG-1) Thr176-Lys238 (Accession #NP_001153480) was produced in E. coli cells at Cell Signaling Technology. >98% as determined by SDS-PAGE of 6 μg reduced (+) and non-reduced (-) recombinant hNRG-1. All lots are greater than 98% pure. 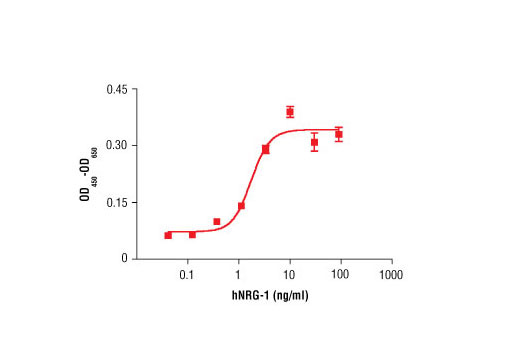 Recombinant hNRG-1 does not have a Met on the amino terminus and has a calculated MW of 7,284. DTT-reduced and non-reduced protein migrate as 6 kDa polypeptides. The expected amino-terminal TSHLV of recombinant hNRG-1 was verified by amino acid sequencing. The bioactivity of recombinant hNRG-1 was determined in a cell proliferation assay using MCF7 cells. The ED50 of each lot is between 1-4 ng/ml. Less than 0.01 ng endotoxin/1 μg hNRG-1. With carrier: Lyophilized from a 0.22 μm filtered solution of 20 mM citrate, pH 3.0 containing 100 mM NaCl and 20 μg BSA per 1 μg hNRG-1. Carrier free: Lyophilized from a 0.22 μm filtered solution of 20 mM citrate, pH 3.0 containing 100 mM NaCl. NRG-1, a member of the EGF family, is involved in heart, mammary and nervous system development (1). NRG-1 is expressed by mammary epithelial, vascular endothelial and neuronal cells (2,3). At least 15 NRG-1 splice variants are known (1). These variants differ in EGF domains (α or β variants), amino-terminal splicing sites, and incorporation of exons encoding integral membrane regions (1). NRG-1 can induce or inhibit the proliferation of cells derived from breast cancer. The differences in effects of NRG-1 appear to depend on splice variation and interaction with receptor(s) (2). NRG-1 binds to ErbB3/HER3 or ErbB4/HER4. Binding induces dimerization with ErB2/HER2. The Akt, Erk1/2 and Erk5 pathways have been shown to participate in NRG-1 activated signaling (4,5). NRG-1 appears to have roles in schizophrenia and breast cancer (1,4,6). Falls, D.L. (2003) Exp Cell Res 284, 14-30. Chua, Y.L. et al. (2009) Oncogene 28, 4041-52. Kalinowski, A. et al. (2010) FASEB J 24, 2567-75. Montero, J.C. et al. (2008) Clin Cancer Res 14, 3237-41. Grossmann, K.S. et al. (2009) Proc Natl Acad Sci U S A 106, 16704-9. Mei, L. and Xiong, W.C. (2008) Nat Rev Neurosci 9, 437-52. Liu, B. et al. (2012) Neuro Oncol 14, 994-1006. Ioannou, N. et al. (2013) BMC Cancer 13, 41. Zhang, K. et al. (2012) Oncogene 31, 4609-18.